He sported a two-day beard and a fedora that practically covered his eyes. He said precious little save for introducing two of his 18 songs. Neil Young seemed to be moody and melancholy during his 1-3/4 hour performance at Northrop on Thursday. Moody and melancholy in his songs about love, the environment and war. He reflected on lost loved ones (citing his longtime guitarist Ben Keith by name and alluding to longtime film/video director L.A. Johnson in song), longtime love relationships and the joy of a young granddaughter. He honored the past (with 11 reshaped old favorites) but he insisted on journeying into the future by playing seven tunes from his forthcoming “Twisted Road” CD. He’s restless and reflective. And, as I explained in my review, it was all solo – just his voice and a guitar, keyboard or harmonica. He was in good voice, preferring a sweet, gentle grace over his snarling, ragged glory witnessed in arenas. 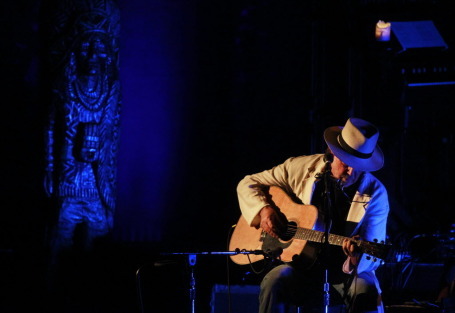 The stage set featured some of the props from recent tours, including what appeared to be a cigar-store Indian statue that Young would often face between songs as if he were honoring, consulting or praying to a spiritual icon. Opening was Scottish folk legend Bert Jansch of Pentagle fame, a gifted guitarist and singer who thanked the sell-out crowd for being so quiet and listening to him.